Our first trip to Anguilla was in November 1985. We stayed at Malliouhana for a week. During this time they had valet parking at the front lobby. We enjoyed the quiet and peacefulness of the island. The next year, we returned for 8 nights (we keep adding a day each year). On this trip, we took the ferry over to St. Martin for the day to do a little shopping and have lunch. We were walking around Marigot, when we heard a young man yelling at us, "Mr. & Mrs. Morris! Mr. & Mrs. Morris!". He was waving and waving at us with a huge smile on his face. We just looked at each other and were totally confused as we didn't know any of the locals on St. Martin. "My name's Oliver...I parked your car at Malliouhana last year when you were there". We were thunderstruck that this young man would remember us a year later after only a week in Anguilla... remember our name and on a totally different island (where he was working at the time). from getting married to Patsy, to building his own home, to having three extraordinary sons. 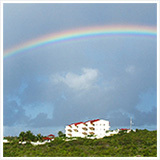 Since 1985, we have been returning to Anguilla about two times a year, staying at different hotels and villas. Oliver is only one of many friendly Anguillians who we have met over the years. But it was this friendly, remarkable, young Anguillian man who helped us realize that we were meant to be on this island. Larry and Linda have been such great friends since first meeting them in 1986. Not only that, they are great friends to all of Anguilla! We both love this story and have told it many times to others explaining why Anguilla is so special. This story tells why. And then we met Linda and Larry...and the friendships grew from there. Another story... which I should write! The Morris's story is the best! Great story! Anguilla is a wonderful island full of Olivers. "A Little or A Lot"
"A Lot"! How can you not say, "WOW"? This is a "WOW" moment with all of these true and great comments for our dear friends Larry and Linda. They have certainly shared "their" Island and Oliver with many of us. This is just one special story. (Can't you just see it being shared over a great glass of wine?") Anguilla is a beautiful place to be and you can't help but return over and over again. It is an Island of serenity with everyone treating you like you are home. It is true that no matter where you venture, someone will know Larry and Linda. With Larry and Linda you don't need a travel guide or agent. They will be certain that you experience it all! Our vote for #1 is definitely Larry and Larry! 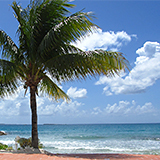 We have been to the Caribbean many times and visited several islands. Having never been to Anquilla, Larry & Linda's 'thumb's up' is enough for us! (I guess it helps that we're looking at 6 inches of snow right now, ha!) Our vote is for Larry & Linda. A little saying a few us throw around that has so much truth! Linda and Larry are such GIVERS and we would be happy for them both to receive this prize. Anytime I hear about Anguilla, I immediately think of these two lovely people. GO LINDA and LARRY!!!!!! The story of Oliver is the only one that really shows how special Anguilla is over any other place I've visited in the Caribbean. The way that young man remembered and greeted the couple after meeting them only once, and how he went on to do great things on the island himself is quintessential Anguilla. Larry and Linda are awesome. I don't know why they don't have dual citizenship to Anguillia........perhaps an honorary one will be give out to them. They love this island and it a home away from home to them. Hopefully they will win this story! Larry and Linda and Anquilla go together! So Larry and Linda raved so often about Anquilla that we joined them with our son and daughter-in-law for a warm and wonderful week a couple of years ago. We had a spectacular time and loved all the places Larry and Linda took us to. I still am amazed at the color of the "aqua". Even though we are related to Larry and Linda, we know they deserve to win this prize....There are no greater advocates of an Anquillan vacation than this couple. Hope they win! I vote for Linda and Larry - Oliver is a sweetheart. The story about "A Remarkable Anguillian" is a great story. Isn't is nice to know nice people. Larry and Linda are nice people and that is why the Remarkable Anguillian remembered them. Keep it in the family!!!!! When Linda and Larry talk about Anguilla, you can see their love of the island in their faces and hear it in their voices. If they weren;t family, we'd be jealous! Linda& Larry love Anguilla (as you can tell from their numerous visits). They tell everyone they meet about Anguilla, the wonderful beaches, food and friendly people. I'm sure they have brought alot of tourists to the island. They truly love the island and should win the contest!!!! I never got around to writing my own entry for this contest since I'm not sure when I'll be back to Anguilla but did enjoy reading thru them - I have to give Linda and Larry the edge - next to what I would have written there's is the best! party on Wayne...party on Garth...! Larry and Linda just love Anguilla!- we have yet to join them but are considering a trip very soon. There are no better friendly "party" people on the planet! they get my vote 100% of the time. Linda and Larry are friends of ours and consider Anguilla their second home. They have as many friends there as they have in the states. Our vote is for them. Wonderful story Linda and Larry! The friendliness of the islanders really shines through in this story. No wonder visitors keep coming back! You get our votes, both of them. Anguilla is better because you visit so often. Great story and passion about the place! Wonderful people! Wonderful locale! Thanks for sharing. 5 Palm Trees for Linda and Larry they truly love and are Ambassadors for Anguilla. Great Story Great People ! Vote for Linda and Larry Morris :) Cheers ! Lovely travel story! Makes us want to travel to the islands!!! My husband and I had the pleasure of visiting the Island with Linda and Larry. It was Linda's birthday and a great celebration at Oliver's. I was impressed by the friendliness of the local people and they seemed to know us. We were Larry's friends. I know Linda and Larry love Anguilla and their love of the island and the people is contagious. You cannot go without wanting to go back again. Anyone who knows Linda and Larry loves them. However, I recall Larry telling this story over a couple of bottles of fabulous red wine. It seems that the reason Oliver remembered him so well after a whole year was because that Larry thought a week's worth of valet service at Malliouhana was complimentary!! Just kidding. Hope you win. Love you guys! So many great memories with you in Anguilla and elsewhere. Looking forward to the next time. Wonder what I can trade for a bag of M&Ms this year? $1000 bottle of wine to go with the B&D ribs, maybe? In my dreams! Anyone who knows Linda and Larry loves them. However, I do recall Larry telling this particular heartwarming story over a bottle or two of fabulous red wine. I believe the real reason that Oliver remembered them so clearly after a full year was that Larry thought that the valet parking for the week at Malliouhana was complimentary!! Just kidding. Hope you win. One night over dinner, Linda and Larry shared their passion for Anguilla with us. They waxed poetic about the warmth of the people, the beauty of the land, its rich history and the delectable food. They inspired us to visit Anguilla. We had a wonderful, memorable time. We found every thing they said about Anguilla to be true. I know for a fact, they have also influenced many others to visit the island. They are ambassadors for Anguilla. We vote for Linda and Larry because their love for the island is authentic and deep. They have been committed, loyal, visitors and have developed "family" on the island - people they love and by whom they are loved. As we traveled about the island, visiting restaurants and shops, wherever we mentioned their names, we discovered they were known and cherished. My husband and I first visited Anguilla in 1994 and have returned many times since then. We couln't agree more! We have met so many wonderful people over the years on our visits and look forward to seeing them again each time. They are part of what makes each visit to Anguilla special. Back here in New Jesrey, Larry and Linda Morris speak of the people of Anguilla like they are family. I hope to be able to meet some of them myself someday. Until then, I will have to settle for eating Anguillian from the copy of "At Blanchard's Table" to which Linda and Larry treated me. Unless, of course, Oliver publishes a cookbook -- and in that case I will have to pick up a copy! My wife and I first met Linda and Larry on Scilly Cay in 1987. At that time the island was mostly populated by Arawak Indians, Eudoxie and his Sandra, and Oliver. Uncle ernie was a teenager! We soon realized that the Morrises were great folks and easy to score a drink or a glass of wine from. so we have continued to do it for close to 25 years now. Certainly, as original settlers, the Morrises deserve to win this contest. We will see Linda in Florida next month and see most all the old AOL board in Anguilla in december, including both Morrises. Like Larry and Linda, we have stayed in countless hotels and villas on island. It's just an unforgettable place. But, as my late mother, then in her dotage used to ask.."Why do you go to Africa every year"? Never could really explain that it wasn't Angola. Larry & Linda are "right on" with their story! My Husband & I have been visiting Anguilla since the 80's, celebrating many of our milestones (honeymoon, anniversaries, etc.) on the Island! Often when we would return, smiling faces would great us with "welcome home!". Recently we had the pleasure of enjoying Anguilla with Larry & Linda in a lovely villa. They are truly Anguillians at Heart, as are my Husband & I! Good luck in the contest to our friends, Larry & Linda! I believe Mr. And Mrs. Morris are hard to forget & easy to love, as is Oliver. We've had the pleasure of getting to know Oliver over the 18 years we have been visiting Anguilla and he is just as Linda and Larry describe him. Larry and Linda are great friends of me and my husband. Since we've meet them 10 years ago, they've always travelled to Anguilla as a "home away from home." We've also travelled to the beautiful island with them and had a great time. They introduced us to Oliver and took us to his restaurant, where we wined ad dined and had a wonderful evening. I think Larry ad Linda should win the contest, as they are true "Anguillians" at heart! My husband and I could also write this same story as we came to Anguilla over 15 years ago for a week and added several days to our stay each year - now we also come twice a year for several weeks because of the same reasons - the unique features of Anguilla and the wonderful, friendy people of Anguilla who remember us from many years ago. What makes Anguilla so special is all about this story and many, many others we could tell just like it - it is like returning to another place and time in history from long ago.